We tried a date night subscription box & here’s the scoop. Leave a Comment on We tried a date night subscription box & here’s the scoop. Ah, I’m sad to say, it’s been a long time since the hubby and I have had a date night. Well, a date night out and alone without our daughter. In the meantime, we decided to try a date night subscription box. So, what is a date night subscription box? It’s everything you need for a date night at home. After some research I decided to try Date Night Box Club. After I ordered, my box took forever to come! Apparently I missed the deadline for that month’s box so I had to wait for next month’s. Anyway here’s what we got…. I was so excited when the box arrived and even though my husband thought a “date night in a box” was kind of silly, he also was curious to see what we would get. Previous boxes that they sent out were cool like paint night and a Hawaiian themed box. But we were not too happy with this box above. 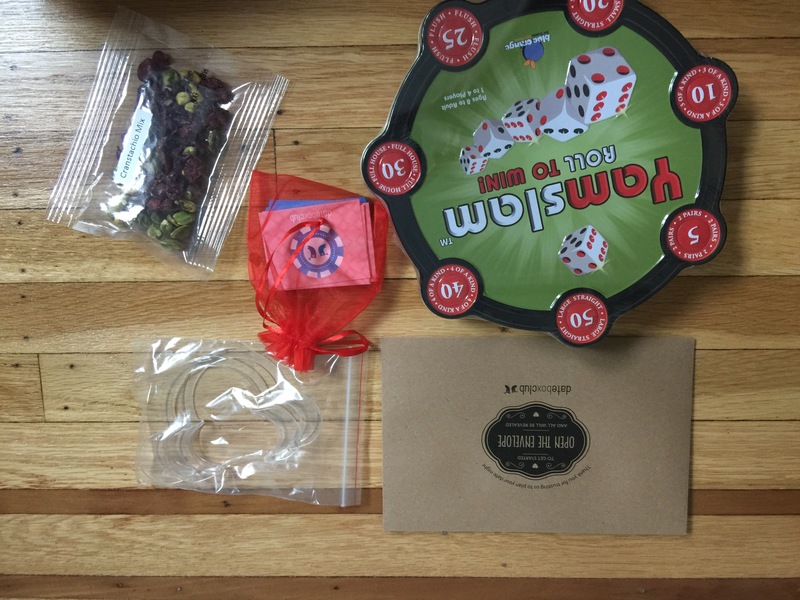 It came with cranberry pistachios, 2 games, and questions to ask each other. We tried to muster up the energy to learn these games and give it a go but we never did! The box just sat there! But, I didn’t want to give up. After some more research I found out this same company offers some of their boxes on Amazon. Gasp!! It’s cheaper and you get to choose your box. And though I typically love surprises, uh, I wasn’t going down that road again. So, for round two, I ordered their spa night box. It was cheaper, arrived faster, and shipping was free! This box was so worth it! 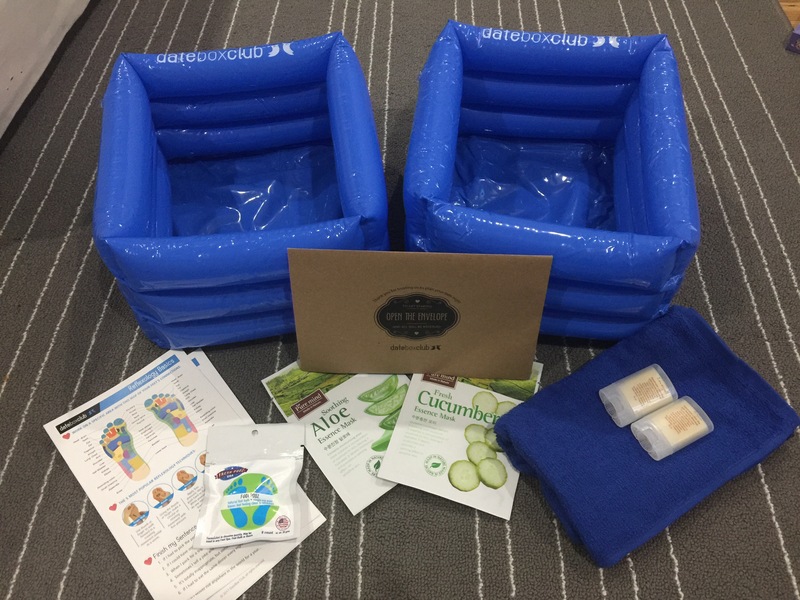 It came with two inflatable foot baths, bubble pods that activate in the water, 2 face masks, 2 lotions sticks, 2 small towels, questions to ask each other and foot massage cards. It may seem silly to have a date night at home but this wasn’t too bad. My husband humored me and gave it a go. It was nice to switch up our typical “Netflix & Chill” routine we had going. Overall? I wish subscriptions like these were more personalized or had more options. The first box was a no-go for us but the second was actually kind of cute and fun. Now, since I don’t want to be “surprised” again like I was with the first box, I ended my subscription. But I definitely have gotten a lot of ideas for more interesting nights in. Would you try a date night subscription box? Follow me on Facebook, Instagram, & Twitter!! Previous Entry Is having your spouse as your BFF overrated? Next Entry The rise of the “side-chick”.